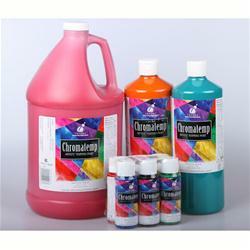 Chromatemp provides elementary students with: Long shelf life, no shaking or stirring, does not separate, dries to an opaque, matte finish, bright intermixable colors, freeze/thaw stable over paint without lifting, easy soap and water cleanup. However you decide to paint (using a brush, your fingers, a palette knife or even a sponge), children's creativity shouldn't be restricted and neither should their paint. Our vibrant Traditional colors add the perfect touch, gleam and glitter to every project. They're formulated to provide inspiration for the budding artist.